East of U.S. Route 3 in the village of Groveton over the Ammonoosue River. The bridge is 126'0" long with a clear span of 108'3". It has an overall width of 21'0" with a roadway width of 15'0", and a maximum vertical clearance of 13'0". The bridge is restricted to foot traffic only. The bridge was built by Captain Charles Richardson and his son. 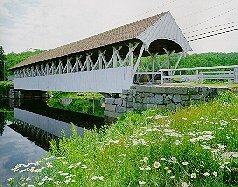 When U.S. Route 3 was reconstructed in 1939, the Groveton covered bridge was bypassed. It was repaired by Milton Graton and his son Arnold in 1964-1965. A water supply line is suspended beneath the bridge. The Groveton Bridge is eligible for listing on the National Register of Historic Places.